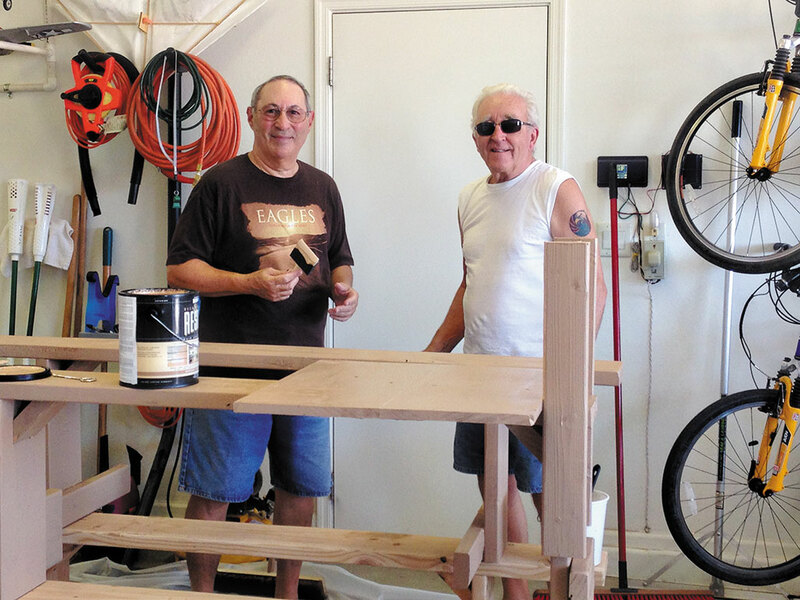 Alan Friedman, left, and Marv Enerson complete work on benches and flight tables for the club field. With their hard runway surface and helicopter pad complete, the Casa Grande RC Flyers are looking into other improvements for their airfield. Under consideration is construction of sun shades over the table area for the pilots during the summer. The club hopes to complete that project by next summer. This season the club will combine its monthly fun fly and swap meet starting in November on the second Saturday of each month. These events will take place November through April, starting at 9:00 a.m. The events are publicized on the club and AMA websites and in the AMA magazine. The club plans to install a remote weather station at the field, too. This station would allow members to see the weather at the field via an application on their smart phone or on the club web site before heading out to fly. Wind speed, direction and temperature would be shown. Starting in November the club will go back to the winter event schedule, which includes flying on Tuesday, Thursday and Saturday mornings. November will also mark the start of the club’s monthly swap meets and fun fly events. Many Robson Ranch residents have enjoyed watching these events and are welcome to join us again. Remember to bring a lawn chair when visiting the club field to watch the flying. Toilets and free parking are available at the field. The Casa Grande RC Flyers and their flying field should not be confused with the field and club located within Robson Ranch. Some residents reported going to the Robson field in error when trying to attend Casa Grande RC Flyers events. Directions to the Casa Grande RC Flyers field are found on the club website at www.CasaGrandeRCFlyers.com. Casa Grande RC Flyers events are listed in the Casa Grande Dispatch, the club website and the Robson Ranch Views and take place at their Casa Grande RC Flyers Field in Casa Grande, not in Robson Ranch. Membership in the Casa Grande RC Flyers is open to anyone wanting to fly or learn to fly radio controlled aircraft, regardless of their residence. Free lessons are offered by any of seven AMA certified instructors. The first year club dues are $40 per calendar year, and renewal dues are $25 annually. Membership in the Academy of Model Aeronautics (AMA) is required because AMA membership provides the pilot with the required insurance coverage. Details about both the AMA and the Casa Grande RC Flyers are on the club website as well as a list of all club activities and other area AMA clubs. Club members also receive discounts on purchases at area hobby shops. The Casa Grande RC Flyers is an Arizona non-profit cooperation dedicated to exposing the joy of flying to the public and giving back to the community by supporting worthwhile charities. For more information about the club contact Alan Friedman, the club president, at his Robson Ranch home, or visit the club website: www.CasaGrandeRCFlyers.com.